Changes to China’s State Administration of Foreign Exchange (SAFE) rules: a new dawn for the provision of Chinese cross-border security and guarantees? On 1 June 2014, new regulations1 and guidelines (collectively the Rules) were implemented by SAFE. The Rules relax Chinese foreign exchange controls limiting the provision of Chinese cross-border security or guarantees (cross-border security) and are relevant to anyone who either relies on or provides cross-border security. This includes (for example) banks providing financing for purchases of vessels or aircraft, and the buyers of newbuildings who wish to rely on refund guarantees provided at the behest of the yard constructing the vessel. It also includes PRC companies being named as the guarantors of charterers (e.g. under NYPE time charters). A few issues remain to be clarified: existing Chinese legislation has not yet been amended to reflect the Rules, and it is unclear whether the Rules will apply retrospectively. Still, the Rules appear to mark a new dawn with regard to cross-border security. Cross-border security had to be pre-approved by SAFE for the cross-border security to be valid. If, on attempted enforcement, the cross-border security was deemed invalid, SAFE would not approve payment out of China. Under Chinese law, liability for the invalid cross-border security was apportioned according to the respective fault of the parties for failing to pre-approve the cross-border security.2 The result in most cases was that the recovery of the party seeking to rely on the cross-border security was dramatically reduced, even though the guarantor or security provider was solvent. In Emeraldian Limited Partnership v Wellmix Shipping Limited, Guangzhou Iron & Steel Corporation Limited3 a guarantee was granted by an onshore guarantor on behalf of charterers, without SAFE pre-approval having been obtained. Chinese legal experts submitted that the guarantee was invalid, and applying Chinese legal principles of civil liability, the guarantor’s liability should be reduced to 50%. The case illustrates the great commercial uncertainty faced by parties as a result of the old SAFE rules. The problem was most acute where the security provider’s assets were all located in China (as enforcement against those assets was subject to Chinese law). Where the security provider also had assets abroad, the party seeking to enforce the cross-border security often fared better. The Rules: a new dawn? 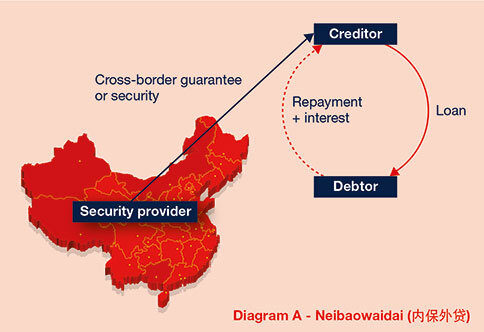 Neibaowaidai (内保外贷): cross-border security provided by an onshore security provider to an offshore creditor, to secure the debts of an offshore debtor. Prior approval/ registration is not a pre-condition for neibaowaidai to be effective but, neibaowaidai must be subsequently registered with SAFE. 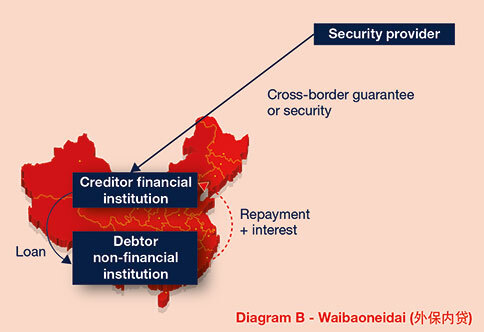 Waibaoneidai (外保内贷): cross-border security provided by an offshore security provider to an onshore financial institution (creditor), to secure the debts of an onshore non-financial institution (debtor). The onshore financial institution is required to report the transaction to SAFE. Prior approval/registration is not a pre-condition for waibaoneidai to be effective but subsequent registration with SAFE is required. Others (其他形式): This refers to all other forms of cross-border security (which accord with the definition used under the Rules) that do not fall into categories (A) and (B) above. There are no registration or approval requirements from the perspective of foreign exchange controls for this category, unless SAFE otherwise specifies. An example of cross-border security falling in this category is security over onshore assets provided by an onshore company to secure debts owed to an offshore bank. Parties taking cross-border security should always identify which category applies so as to ensure that the relevant registrations with SAFE are made. Parties should also review other aspects of the security (in addition to SAFE issues) which may be subject to PRC/foreign law (e.g. capacity of the guarantor/security provider and the signatory(ies)) to ensure that the relevant security document is enforceable. A fuller article about the SAFE Rules can be found here: http://www.hfw.com/Changes-to-the-PRCs-SAFE-Rules. For more information, please contact Patrick Cheung, Partner, on +852 3983 7778, or patrick.cheung@hfw.com, or Caroline Thomas, Associate, on +852 3983 7664, or caroline.thomas@hfw.com, or your usual contact at HFW. Research by Gabriella Martin, Trainee. Security Law of PRC (Article 5). In response to growing interest from the dry cargo market (in particular, dry bulk charterers) in the use of electronic documentation, and a general drive towards developing electronic solutions for facilitating trade in shipping, BIMCO have developed a specific clause for charterparties (the BIMCO e-Bill Clause) which seeks to address the use of electronic bills of lading (e-Bills) documentation. “(a) At the Charterers’ option, bills of lading, waybills and delivery orders referred to in this Charterparty shall be issued, signed and transmitted in electronic form with the same effect as their paper equivalent. (b )For the purpose of Sub-clause (a) the Owners shall subscribe to and use Electronic (Paperless) Trading Systems as directed by the Charterers, provided such systems are approved by the International Group of P&I Clubs. Any fees incurred in subscribing to or for using such systems shall be for the Charterers’ account. Sub-clause (a) provides that e-Bills have the same status and effect as paper bills. The aim here is clear: to replicate the functional equivalence between paper and e-Bills, and to seek to avoid (as far as possible) the legal limitations potentially imposed under English common law and the Carriage of Goods by Sea Act 1992 (in particular, the issues raised as to whether e-Bills amount to documents of title or not). As their use is at charterers’ option, and there is no timeframe within which to exercise this option, charterers appear to be in the driving seat. Sub-clause (b) obliges owners to subscribe to the electronic trading system(s) approved by the International Group of P&I Clubs (currently, Bolero and ESS). Significantly, charterers may direct owners to subscribe to more than one approved system – providing charterers with a degree of flexibility – although there is no obligation for owners to notify their P&I Club. At present, neither Bolero nor ESS charge shipowners to register/use the electronic system. Those charges are borne by charterers and the sub-clause reflects this. All parties involved in the charter chain must sign up to the electronic system(s) as there is no participation without registration. The registration process itself establishes a contractual relationship between the third party system provider for user authorisation and access to data essential to enable the electronic documentation process to function. Sub-clause (c) provides a wide indemnity in favour of owners for “additional liability(ies)” arising from the use of the approved systems (save for those arising out of owners’ negligence). This was introduced in response to owners’ concerns about unidentified liabilities, which might materialise from participating in a process with which they are not familiar. Overall, the BIMCO e-Bill Clause strikes a reasonable balance between promoting the use of e-Bills and protecting the interests of owners as far as possible. As such, charterers may exercise their option to use e-Bills at any time and owners have to be prepared for this eventuality. As is often the case, the BIMCO e-Bill Clause probably does not represent a complete answer for parties seeking to use e-Bills, especially outside the charterparty contract. For e-Bills to work, they require the varied number of parties involved in the shipment of goods (who have differing systems and processes in place) to be party to the electronic system. It has also been suggested that the effect and recognition of an e-Bill in other jurisdictions remain unclear. For example, the suggestion is that difficulties may arise in respect of electronically recorded arbitration agreements in jurisdictions which apply the New York Convention (which only recognises agreements in writing) and this may affect the recognition and enforcement of an award. In relation to any liabilities which would equally have arisen in relation to paper bills of lading, cover is available for P&I liabilities in the ordinary way when using e-bills. If liabilities have arisen solely due to the use of an e-Bill, cover will be available provided the electronic trading system has been approved by the International Group. However, risks associated with the use of computer systems (such as hacking, theft of information, viruses) are not covered by P&I clubs and any owner wanting this specific extra cover will need to make separate arrangements. The BIMCO e-Bill Clause is, however, certainly a step in the right direction, and is likely to develop over time. It remains to be seen whether the container sector will now follow suit in adopting a similar provision. For more information, please contact Alessio Sbraga, Senior Associate, on +44 (0)20 7264 8768 or alessio.sbraga@hfw.com, or your usual contact at HFW. The NEW FLAMENCO: benefiting from a breach of contract? Following any breach of contract, an innocent party will usually seek to mitigate any loss that has arisen as a result. In some cases, the breach will allow the innocent party the chance to take advantage of an opportunity which it had not otherwise considered, perhaps leaving it in a considerably more advantageous position financially. Such a situation arose in The NEW FLAMENCO1. In this case, the English Commercial Court considered the principles which dictate whether an innocent party’s apparent “windfall” as a result of commercial decisions made following a breach must be credited against any damages awarded as a result of the breach. The NEW FLAMENCO (the vessel) was time chartered in 2004 to Globalia Business Travel (Charterers). In June 2007, the parties orally agreed an extension to the charterparty up to 2 November 2009. However, Charterers disputed having agreed that extension, and asserted that they were entitled to redeliver the vessel in October 2007. Accepting Charterers’ position as an anticipatory repudiatory breach, Fulton Shipping Inc (Owners) terminated the charterparty and the vessel was redelivered in October 2007. Having accepted the breach, Owners entered into a sale contract shortly before redelivery, selling the vessel for a little under US$23.8 million. They commenced arbitration against Charterers in early 2008, claiming damages by reference to the net loss of profit that Owners said they would have earned between October 2007 and the extended contractual redelivery date of 2009. By the time of the arbitration hearing in 2013, it was clear that, due to the 2008 financial crisis, the value of the vessel in 2009 (i.e. on contractual redelivery) would have been approximately US$7 million – significantly lower than her actual 2007 sale price. Charterers argued that, therefore, Owners had benefited from Charterers’ breach and should give credit for the difference between the Vessel’s sale price and her 2009 value. Owners argued that the difference in value was legally irrelevant. The arbitrator agreed with Charterers, with the effect that Owners recovered no damages because the credit for the sale exceeded Owners’ loss of profit claim. On appeal, the Commercial Court overturned the arbitrator’s decision, holding that the benefit Owners achieved through the higher 2007 sale price had not been legally caused by the breach, but rather by market fluctuations and by Owners’ independent commercial decision to sell the vessel when they did. Charterers’ breach had merely provided the “context or occasion” for the sale, but did not cause Owners to sell the vessel. The sale “could, in principle, have occurred irrespective of the breach”. In considering the relevant principles as to when a benefit should be credited against damages for breach, the Court held that the test is that the breach has caused the benefit, not just that it provided an opportunity for the innocent party to obtain the benefit. The fact that an action is a reasonable step taken in mitigation does not necessarily mean it is caused by the breach, particularly if that step could have been taken in any event. The Court also held that all the circumstances must be considered, and it is a question of fact and degree as to whether there is a causal link. Furthermore, benefits should not be taken into account where it would be contrary to justice, fairness and public policy, particularly if it allowed the wrongdoer simply to take advantage of something the innocent party did for its own benefit. Finally, the Court noted that the logical consequence of applying Charterers’ argument to a situation in which the market had fallen, would allow an owner to claim additional losses, which the Court considered to be particularly novel. Although the Court reviewed extensive case law, it has been suggested that it failed to consider other, recent, authorities which suggest that a credit would be given if there was a simple causal link between the breach and the benefit. The judgment is being appealed, and as there is clearly a wide potential impact on contract law and assessment of damages this is awaited with interest. However, the decision may, in the meantime, provide some reassurance to owners in a similar situation. For more information, please contact Eleanor Ayres, Associate, on +44 (0)20 7264 8320, or eleanor.ayres@hfw.com, or Marie-Anne Smith, Associate, on +44 (0)20 7264 8051, or marie-anne.smith@hfw.com, or your usual contact at HFW. Must parties comply with a clause requiring them to engage in “friendly discussion” before commencing arbitration? In light of the recent High Court decision in Emirates Trading Agency LLC v Prime Mineral Exports Private Limited1, which boldly departs from the approach normally taken by the English courts, they may now be obliged to do so. In 2010, Prime Mineral Exports Private Limited (PMEPL) commenced ICC arbitration proceedings against Emirates Trading Agency LLC (ETA) under a Long Term Contract (LTC) relating to the purchase of iron ore. ETA subsequently applied to the High Court under s.67 of the Arbitration Act 1996 challenging the tribunal’s jurisdiction based on the contention that the LTC contained a dispute resolution clause requiring the parties, as a condition precedent, to engage in time-limited friendly negotiations before referring the dispute to arbitration. The Court held that the LTC dispute resolution clause was enforceable but that it had been satisfied by the parties’ pre-issue negotiations. Having distinguished a number of English authorities, which would otherwise have bound the Court, the Judge found the clause to be complete (with negotiations subject to the “identifiable standard” of good faith, namely fair, honest and genuine discussion), certain (due to the inclusion of a time frame and clear terms), and, overarchingly, in the public interest. Interestingly, the Court appeared to be persuaded by case law from other jurisdictions relied upon by ETA in support of their argument that the condition precedent was enforceable, most notably the Australian case of United Group Rail v Rail Corporation New South Wales2, which concerned a similar clause requiring the parties to undertake “genuine and good faith negotiation with a view to resolving the dispute”. For more information, please contact Holly Colaço, Associate, on +44 (0)20 7264 8278, or holly.calaco@hfw.com, or your usual contact at HFW.